There were plenty of new bikes and kit at the show from a number of different manufacturers, and although it was diffcult to pick out the highlights, here’s our choice of the five new 2016 bikes that really caught the eye. First up we have the Colnago CLX, which has been reworked for 2016. The bike is marketed as Colnago’s “affordable” race bike, although with this Ultegra-equipped version coming in at £3,499 with Fulcrum Racing 5 wheels, all things are of course relative. The CLX has the same geometry as the Italian brand’s thoroughbred race bike, the V1-R, but uses a slightly lower grade of carbon-fibre which might mean some compromise when it comes to weight and stiffness, but it does prevent costs spiralling into the stratosphere. That said the bottom bracket of the CLX is the same as on the V1-R which should hopefully mean this bike will still be comfortable in a race situation. The bike will be available in four different colour schemes and eight differnt sizes, all the way down to a 42cm, small enough for the most diminutive of riders. Like it or not, the cyclo-cross season is just around the corner, and if you’re after a new race bike then the new Kinesis CX Race certainly looks worthy of consideration. The stand-out feature of this scandium frame is that it is designed just as well with disc brakes as it does with cantilevers, with flat mounts at the rear and a choice of forks depending on which braking system you choose to go for. The frame, which will cost £549.99 when it becomes available in September, has also been optimised to work best with single ring setups, such as SRAM CX1, however the way the internal cable routing has been designed you’ll still be able to use a two rings and a front mech if you so desire. While the vogue might be to buy a cyclocross bike as a do-it-all machine, attaching racks and mudguards for the commute, the lack of eyelets on the CX Race point to the fact that this is an out-and-0ut racer. 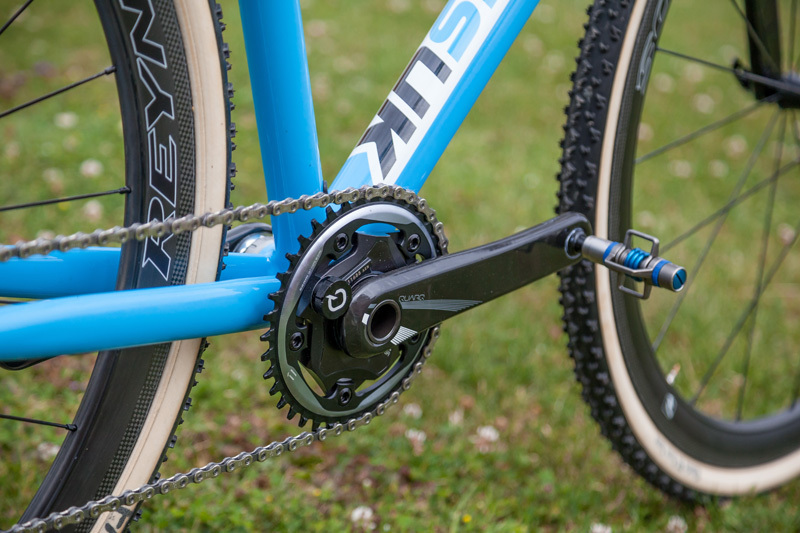 With this in mind Kinesis have given the bike bridgeless chainstays and non-drilled seatstay bridges to help with mud clearance, while the shape of the down tube has been designed to make it easier to grab and shoulder the bike in a race. Kona might not be known for its race bikes but, especially given its slightly lurid colourscheme, this Kona Zing CR really caught the eye. The frame is produced for Kona by Italian tubing specialists Dedacciai, and apparently comes in just under 1,000g for a medium size frame with internal cable routing. The bike will be available in only one build for 2016, and, at £3,299, might be the most expensive road bike Kona has ever produced. This will get you Shimano Ultegra Di2 with a 50/34 chainset and 11-28t cassette. The wheels are the new Mavic Ksyrium Elite wheels, with finishing kit being a mixture of Easton and Kona’s in-house kit. America might not seem like the obvious place to look in search of a steel frame, but this Ritte Stainless Snob certainly seems like a rival for the most elegant of British-made steel bikes. This bike is pretty much the same as the Snob that has been around for a couple of years now, but for 2016 will also comes ready equipped for disc brakes. As you can probably guess from its name, the frame is made from stainless steel, which, according to Ritte, has the same longevity as titanium, but with improved handling and ride feel. We’ll have to see how this plays out when we get the bike in for a test, but what is certain is that this is a very beautiful frame, helped especially by Ritte’s decision to leave half the back half of the bike unpainted, allowing us to appreciate the naked beauty of the stainless steel. The Stainless Snob will be solely be available as frameset only, costing £1,999, with frame you see here matched with a Chris King headset and Enve carbon fork. However this is only a limited edition combination, and unless you move quickly you’ll get the standard edition which will mean an FSA headset and carbon fork. The Light Blue Robinson might also come with a steel frame, but couldn’t really be more different from the Snob. With its frame made from TIG welded Reynolds 725 steel tubing, this is a bike that is designed as a do-it-all machine at home doing a range of tasks over different terrains. The frame is compatible with either disc brakes or rim brakes and has eyelets for racks and mudguards. There’s also plenty of tyre clearance, with enough space for 32mm tyres without mudguards, or 28mm with them, and switchable dropouts to enable you to run single speed set ups if that’s the way you choose to go. However the bike you see here is equipped with the brand new SRAM Rival 1 groupset, with a single ring at the front and a pizza dish of a cassette at the back. The wheels are from Halo with 32mm Schwalbe CX Comp tyres attached.